Me, Inc. features a black simulated-leather cover with gold foil stamping and a black ribbon bookmark. The fact that KISS is one of the most successful rock bands in the world is no accident. From the beginning Gene Simmons and Paul Stanley had a clear-cut vision of what they wanted to do and how they wanted to operate KISS as a business well before they ever first took the stage. Since deciding with Paul to manage the band themselves, Simmons has proved himself to be a formidable businessman, having sold over 100 million CDs and DVDs worldwide, overseen over 3,000 licensed merchandise items, and starred in the longest running celebrity reality show to date. More impressive is that he handles all of his business ventures on his own-no personal assistant, few handlers, and as little red tape as possible. 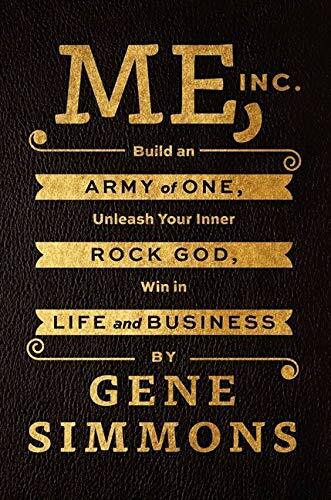 In Me, Inc., Simmons shares a lifetime of field-tested and hard-won business advice that will provide readers with the tools needed to build a solid business strategy, harness the countless tools available in the digital age, network like hell, and be the architect for the business entity that is you. Inspired by The Art of War, the book dispenses Simmons' in-depth insights via thirteen specific principles for success based on his own experience, triumphs, and instructional failures in business-from finding the confidence within yourself that's necessary to get started, to surrounding yourself with the right people to partner with and learn from, to knowing when to pull the plug and when to double-down. These thirteen principles are a skeleton key into a world of success, freedom, peace of mind and, most importantly, financial success.